Copyright law: one step forward, two steps back | What Hi-Fi? Last year it became legal to copy CDs and DVDs for your own personal use; now it's been deemed illegal again by the High Court. The law is a mess, and fails to take account of how technology has changed the way we access music and films. I've been away on holiday and come back to the news that the High Court has overturned last year's changes to copyright law in the UK, which allowed copying of films and music for your own personal use, either for backup or for format shifting to different devices. I've been following this story since the Hargreaves Review in 2011, and it strikes me that last year's changes were eminently sensible. 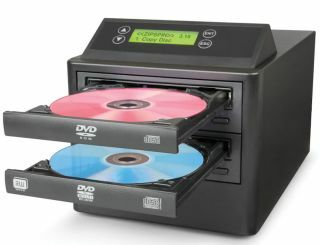 From 1st June 2014 it became legal to make backup copies of CDs and films you own for your own personal use, whether on some sort of hard drive or in the cloud. "Copyright law is being changed to allow you to make personal copies of media you have bought, for private purposes such as format shifting or backup," said the UK's Intellectual Property Office (IPO). "The changes will mean you will be able to copy an album, film or book you have purchased for one device onto another without infringing copyright." The changes were implemented last year under the Copyright and Rights in Performances (Personal Copies for Private Use) Regulations 2014. Given how many of us now copy CDs onto a NAS (network attached storage) device or hard drive for use on our home entertainment systems, or even in the car, that made perfect sense. You'd bought the original disc, so were simply transferring the content to another device to enjoy. The law had finally caught up with how we use technology in the 21st century. And under the 2014 changes, remember, it remained illegal to make copies of CDs, DVDs and Blu-rays for other people or to give them access to your digital files. But now the music industry has sucessfully challenged the new law, and the High Court, in its wisdom, has ruled that the changes made by the Government were "unlawful" due to the lack of any form of compensation for rights owners. You can read the full ruling here. Of course I understand that musicians and film makers need to protect their copyright. That's fair enough. If someone downloads an album or film without legitimately paying for it, then they are breaking the law. However, I have a large collection of CDs. All of which I have bought and paid for. Yes, I can listen to them on my CD player at home. But I also have a hard drive in my car and have copied 10 of my favourite CDs to that so I can listen to the music while driving, and ensure I don't lose the original discs if my car happens to get stolen. That means I am now breaking the law for listening to something I have already purchased. And if I store those same CDs in the cloud (which I do), so I can access them on my laptop, smartphone or tablet, presumably I am breaking the law once again? I am not alone. Increasingly, with multi-room systems and the like, people have NAS drives or media servers for archiving and accessing their music around the house. Presumably it will also be illegal to transfer CDs you've bought to your iTunes library. Has anyone mentioned that to Apple? So should we be "compensating" rights owners for transferring something we've already paid for on to another device? No, I don't think so. Remember the old "home taping is killing music" campaign from a few decades ago? It didn't stop people doing it. So my guess is that, mostly, people will carry on making backups and copies. Does Mr Justice Green then envisage police raids on people's homes to check their hard drives? What about music or films stored in the cloud? And then there's the not insignificant issue of streaming (which I understand is becoming quite popular, m'lud) involving, in some cases, music copied from CDs to the cloud. No wonder the Secretary of State for Business, Innovation and Skills, Sajid Javid, has said that he wants to "reflect further and in due course take a view as to whether... a new private copying exception should be introduced". For now, he accepts that "a quashing order [of the 2014 regulations] is appropriate at this stage". What next? Well the music industry wants a tax to be applied to blank CDs, hard drives, memory sticks and other blank media, which could then be shared among rights holders. Really? So is Government expected to implement a retrospective tax on my NAS drive that I've already bought, or the hard drive built into my car's audio system, or any old CD-R/USB stick I happen to have lying around the house? That hardly seems workable. And surely if it's illegal to copy anything, then we shouldn't be buying blank media in the first place. So sales would dry up and there'd be no extra tax revenue anyway. With fewer and fewer people using disc-based media anyway, and streaming via the cloud or from a portable device becoming increasingly the norm, Government is going to have its work cut out to devise a new law that a) works and b) reflects the reality of how we use technology. Good luck to that.